So it seems I got my holidays confused or something. 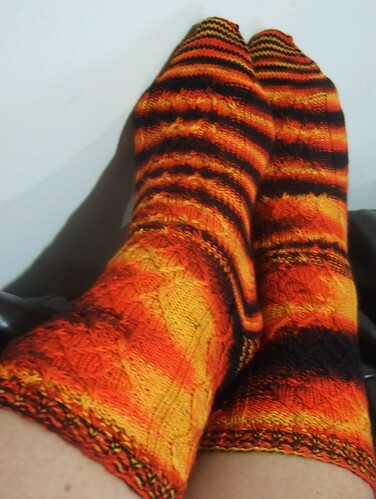 I knit a pair of halloween socks when it’s almost Christmas! 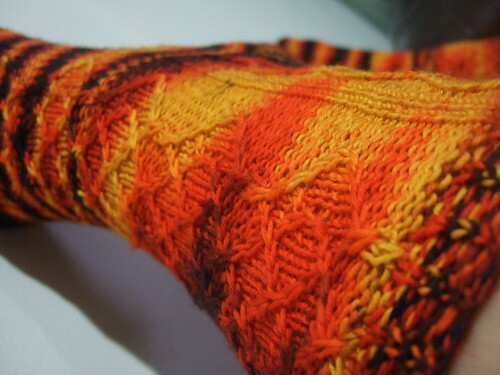 Mary Ann (knittingleftie) had an extra skein of Wollmeise sock yarn in the Thriller colorway. Since I only had one other skein, I decided to buy it from her. I was in the mood to cast on for new things with new yarn so I immediately cast on for these Slippery Socks from Knitty. The pattern is well written and easy to follow. I also decided to use dpns instead of magic loop for these (since I was on a roll with my dpns from the last project). 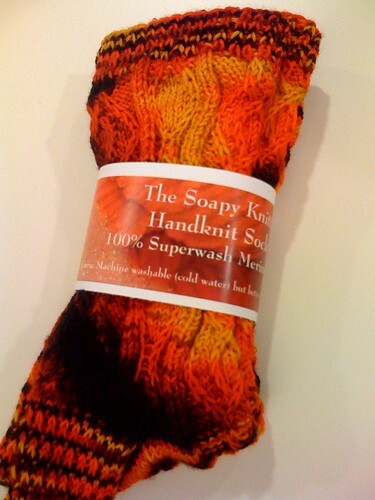 AND…..these are knit TOP DOWN!! I hadn’t knit top down socks in quite a while. 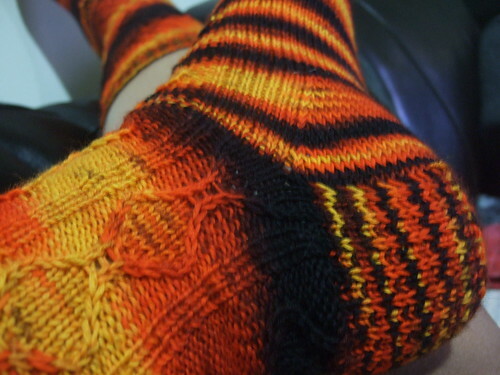 In fact, I usually turn top-down patterns around and knit them toe-up. I sold them to my coworker for the cost of the yarn. She said her daughter will love them. I hope she wears them in good health. Yarn: Wollmeise Sockenwolle 100% superwash 0.64 of a skein, 368 yds). I have enough yarn left over to make a kids pair of socks or adult anklets. Wollmeise is generous with the yardage! Those are some loud socks! It’s a cute colorway and you’ve made a co-worker happy! Great “loud” socks! :o) Loved how you packaged them. AND like your new blog look!! Hi there! Nothing wrong with colorful socks! My DH is watching “Tropical Thunder” and Tom Cruise should be banned from watching Soul Train!!! I call these types of socks “Happy Socks” because bright, loud colors you can see from half a mile away make me happy. I hope she loves them! Loud socks are okay because they are hidden under blue jeans! Hot damn! Those socks make me want to grab my crotch, drink some Pepsi and accidentally light my hair on fire. Hopefully in a few years I won’t buy a monkey…. About halfway through she leans over and says to her husband, "I just let out a silent fart. What do you think I should do?" He replies, " Put a new battery in your hearing aid."